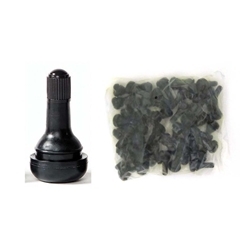 Tubeless Snap-In Valves TR# 415 Rubber Height 1.25" BOWES TV 27-415-500 Bag of 50. 415, EPDM Rubber, Application: 65 psi maximum cold inflation pressure and maximum rim thickness of 0.156". Note: H, V, W, Y and Z speed rated tires require a metal bolt-in style valve. 1.25", .625"